South Africa's digital advertising market has reached critical mass, with a wide range of indicators showing that it delivers reach, effectiveness and cost-efficiency for advertisers who want to reach a mass audience. The New Wave report by Indra de Lanerolle of University of Witwatersrand, research by Peter Langschmidt of Echo, and The Internet Access in SA report by Word Wide Worx all confirm that more than 30% of the country's population is now connected to the internet. Research released in the last week of July 2013 shows that the audience is still growing at a rapid rate. The DMMA, working with Echo's Peter Langschmidt, found that the internet population stands at 14 million people, representing 39% of adults in South Africa. 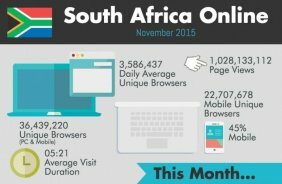 And according to the South Africa Digital Nation report, nine out of every ten people online are now online every day. Some 62% said that they read less newspapers and 59% said that they read less magazines. These stats are making advertisers in South Africa pay attention. Online is undoubtedly the fastest-growing medium in the country. According to AdDynamix, South Africa's online display media market grew by 15% between 2011 and 2012 from R753m to R864m. Its growth out-paces that of outdoor and radio, which are growing at 12% and 10% respectively. After a relatively slow start to online advertising in South Africa, it has a way to go before it catches up to the share of ad spend it commands in other markets. Here, we are talking about local online display media accounting for 2.6% of total ad spend in 2012, whilst in the US it is 15% and in the UK it is 20%. At Kagiso, the improvement in the number of advertisers, orders per advertiser, average deal size, and discount levels were directly related to improvements in the packaging of radio inventory with digital inventory. The numbers validate South Africa's online advertising market as well as the benefits of integrated, and often multichannel campaigns, that blend the strengths of different media. Through integrated campaigns, advertisers get the benefits of radio - such as reach, frequency, call to action, intimacy, and community - as well as the benefits of digital - such as engagement. For example, an online dating site noted a 12x multiple increase in the number of people who purchased a dating subscription online using their credit card when a Jacaranda FM radio campaign was added to its digital campaign, while a large telecom network added over 3, 500 leads to its database as a result of its integrated campaign run on Jacaranda FM and East Coast Radio. For advertisers, the benefits of digital include being able to take their geographic and day-part targeting further, with the addition of behavioural, demographic and psychographic targeting. This allows them to match the audiences they address more closely with accurate demographics which leads to less wastage in advertising spending. We're only just beginning to see how digital technologies will change consumer behaviour over the next 10 years. With the rise of smartphones, for example, mobility is becoming an important part of the mix. Artwork Description Poster advertising Knysna, a town in the Western Cape Province of South Africa. A relaxed couple stroll along with golf and fishing tackle. Artwork Description Poster advertising Port Elizabeth, a holiday resort on the coast of South Africa. Two young women in swimsuits dip their toes in the sea. Truvo (formerly World Directories) is a multinational company specialising in local search and advertising in five countries. Its best known products include Yellow Pages websites and print directories. Honey! I Shrunk the World, is a global digital media handbook launched by Ignitee Digital Solutions Pvt. Ltd. The handbook was launched on 22 December 2009 at Crosswords, Mumbai.